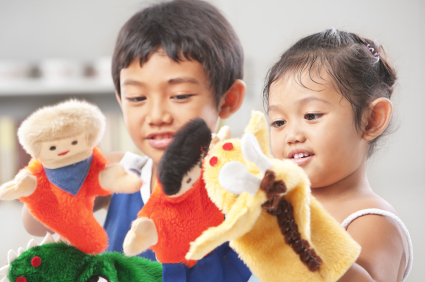 We know that children connect with puppets in a variety of ways. Children listen to what the puppets say. Children really hate to disappoint puppets, and children are remarkably willing to change their behavior to keep the puppets happy. They also have conversations with puppets that they won’t have with anyone else. If you’re looking for another way to communicate with your child, try puppets. The trick, and this is important, is that you change your voice for puppets. The puppets are entirely different characters, and children treat puppets as real characters with unique personalities. The puppets are not you, so don’t use your own voice. Keep that in mind. Story time! Telling stories is a great time to use puppets, whether you’re singing a song, reading a book, or making up a story of your own. Puppets can really help when there is more than one character to bring to life. They help keep that story you’ve read a bazillion times fresh and interesting. Once your kids are familiar with the story, try giving them puppets and letting them do some of the dialog. It’s time to go. If your child is deep in the middle of playing and isn’t easily swayed to move on to the next activity, find a puppet to do the talking for you. The puppet is your spokesperson and is often more convincing than you are. Fascinating, isn’t it? Mind your manners. Puppets are terrific at modeling good behavior. You can have the puppet model the behavior you want. Children have a curious knack for copying that behavior. If it is time to clean up, kids are often very quick to join in when one of their favorite puppets is cleaning up. When it’s nap time, laying the puppet down first often helps kids settle down and get ready to sleep. Puppets are great for teaching kids how and when to say “Please,” “Thank you,” “Here you are,” “You’re welcome,” and other useful polite phrases. Learning new language. Children can sometimes be intimidated when learning new vocabulary and expressions. Sometimes it’s because they don’t understand, and sometimes they simply feel shy. Puppets help with both of these situations. For example, when teaching a young child to ask and/or answer “What’s your name?” “What’s the weather like?” or “Are you hungry?”, seeing that conversation modeled with a puppet first allows them to fully understand what is being communicated and gives them time to become comfortable with the language before using it themselves. But what about me? Some parents and teachers worry that their children will never listen to them, especially with behavior correction. That’s understandable. But realize that children will eventually outgrow their fascination with puppets. You won’t be using puppets all the time, and you’re teaching your child to listen to instructions. If it comes from a puppet sometimes and gets your message across, then for now there shouldn’t be any reason to worry. Which puppet? All of them! If you can use a pen to draw two dots and a mouth on your finger, you’ve got a puppet. If you want to put a little more effort into it, cut the finger off an old glove, paint a face on it, and put that on your finger. Simple, right? So get out those puppets! You can start by singing along with us!